If you think the world is going to hell in a handbasket, step back and look at the bigger picture. One important statistic is child mortality—the number of children who perish below 5 years of age. Over the last 50 years, the world has experienced a hundredfold decrease in this key measure of health, to the point where, in the more developed nations, it is now lower than 1%. The chart shows the extent of the decline, and how the odds of living past the age of 5 have improved in the late 20th and early 21st centuries. 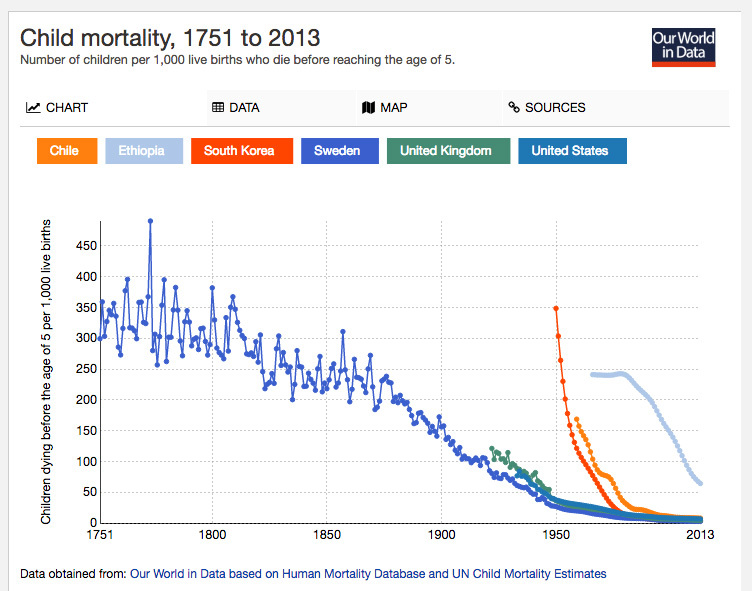 The longest data-set is from Sweden, where, in the 18th century, every third child died, and famines and disasters created a whipsaw pattern of survival. But you can see that the developed countries, and one major African nation, have experienced dramatic improvements in modern times. Overall, global child mortality fell from between 300 and 500 per 1,000 live births (30-50%) to 18.2% in 1960, and further to 4.3% in 2015. This is further evidence of a much bigger trend: that overall, the quality of life around the world is improving. You won’t see that in the headlines or in the news industry’s focus on negative events, but if you can manage to step back and see the big picture, the larger trends are encouraging. Thanks! It is great that more and more children are able to survive below the age of 5 years…This not only shows that the quality of life has improved but also that good and prompt medical facilities are made available to these kids..The analysis was very interesting..